It never fails...every single time Riley and I visit her pediatrician's office or other kid-friendly waiting room, there is always one of those large wooden activity cubes there for her to play with. Those toys must have a kid magnet of some kind located inside, for Riley immediately makes a bee-line straight for that activity cube and plays with it the entire time we have to wait. Since discovering her love for activity cubes, I've searched numerous times to find a top-quality cube for her to play with at home, but have always been discouraged at just how expensive they are. Thankfully, I finally found the perfect wooden activity cube from B. Toys at an unbelievable price. Keep reading to learn more! I reviewed the Zany Zoo Wooden Activity Cubefrom B. Toys, which retails for $59.99 with FREE SHIPPING. 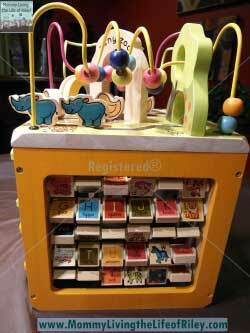 The Zany Zoo Activity Cube from B. 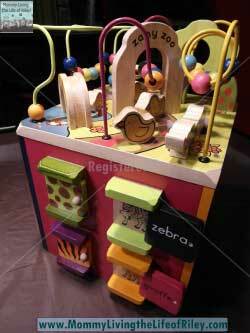 Toys is a colorful wooden cube that has a zoo theme which will delight your child. Loopty-loo routes and zigzag paths with spinners will keep your child entertained for hours while they learn shapes and colors, practice eye-hand coordination and develop their fine motor skills too. The Zany Zoo even won the Creative Child 2010 Toy of the Year! There are plenty of spinners, bead roller-coasters, illustrated animals of every shape and size, and even functional doors which will have your child actively engaged and having a blast! Riley's favorite sections of the Zany Zoo had to be the loopty-loo bead mazes on top of the activity cube and the illustrated spinner animals which had the alphabet displayed on the other side. 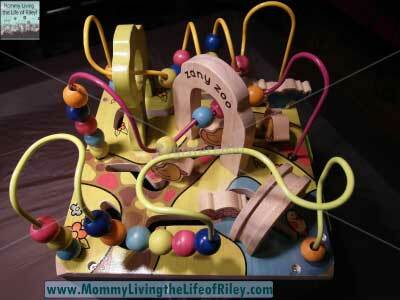 My favorite part is watching Riley's brain at work while being so involved and focused at play. I still can't get over the value of the Zany Zoo either. I've seen similar wooden activity cubes like this which sell for way over $100, but the Zany Zoo retails for only $60! 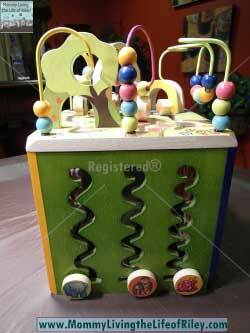 I'm also amazed at the quality of this particular children's toy, for the artwork and illustrations are impeccable and the solid wood construction guarantees that it was built to withstand anything a child could dish out and then some. The size (13.5" x 12" x 18") is also perfect, in my opinion, for the Zany Zoo contains a myriad of activities, but won't take up a huge amount of floor space either. If you have a child between the ages of 1 and 3 years old, then I highly recommend the Zany Zoo Wooden Activity Cube from B. Toys. There's so much here to capture your child's attention and imagination, that you will enjoy watching your child interacting with the Zany Zoo almost as much as they enjoy playing with it! 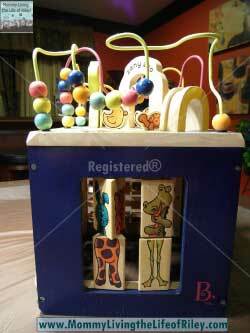 Disclosure: I received the Zany Zoo Wooden Activity Cube from B. Toys in order to facilitate my review. No other compensation was received. This product review is based on my own personal experiences with this item and is completely honest and objective. These educative toys are so cute and colorful at the same time. Kids will really be attracted and interested in playing this. They will not just enjoy playing it but they can also learn from it. Nice blog you got here. This is very great toys..My niece will surely love to play with this! Thanks for the post! When I was a kid I like to have a toy like this.. This is really awesome!